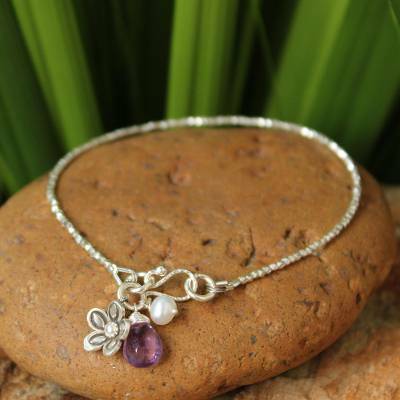 Thai Floral Silver Beaded Amethyst Bracelet, "Blossoming Romance"
Romance and elegance merge in the flirty design of this beaded silver bracelet. Khun Boom crafts it by hand featuring a rose charm from the Karen hill tribe, an iridescent white pearl, and amethyst, stone of spiritual wisdom. The pendants hang from the clasp.